Ghanaian rental company Mobicrane has taken delivery of the first 400 tonne Grove GMK6400 All Terrain crane in Africa, from local distributor Paterson Simons. 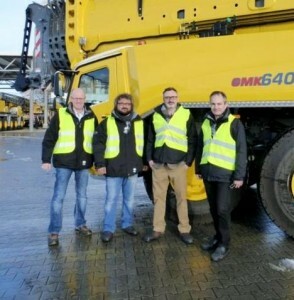 The six-axle GMK6400 has become the rental company’s flagship crane, with its 60 metre main boom and a 134 metre maximum tip height, when combined with its 79 metre luffing jib. Features include a 12×8 drivetrain, Grove’s self-rigging Mega WingLift system and a single superstructure mounted engine, driving the carrier through a drive line that passes through the slew ring. The crane was handed over to Mobicrane at Grove’s German production facility in Wilhelmshaven, with Paterson Simons’ senior engineer receiving specific rigging and diagnostic training.